Speaking at the 2018 Asian Ministerial Conference on Disaster Risk Reduction (AMCDRR) held at Ulaanbaatar, Mongolia, State Minister of Irrigation and Water Resources & Disaster Management Palitha Range Bandara proposed an Asian Emergency Response Task Force for disaster management in the region. AMCDRR 2018 commenced by the Mongolian Prime Minister, was attended by Ministers of Disaster Management and officials from 34 countries. 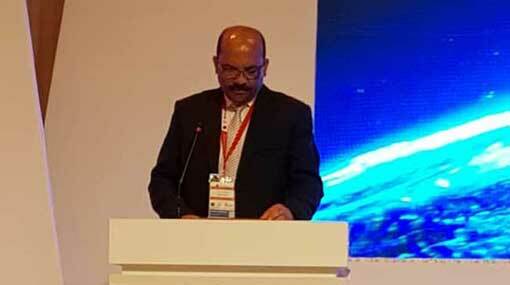 Representing Sri Lanka, the State Minster addressed the AMCDRR on the 2nd day (04th July) of the conference. “Sri Lanka is making every endeavour to reach possible highest development levels with our new development agenda during last decade. Strengthening this further, the launch of our Vision 2025 in the year 2017 was designed to strengthen inclusive and equitable growth and ensuring good governance. As you all are aware, Sri Lanka’s progress in sustainable development is challenged by both climatic induced and other geo-physical disasters, making serious threats to the productive growth of the country. Highlighting the evidence; Sri Lanka has been ranked as the 4th country in the “Global Climate Risk Index -2018”, by GermanWatch, which was a surprising shift from its previous rank of 98, in 2016. This was attested with continues flooding events in May 2016 and May 2017, affecting south-western region of the country accounted over USD 440 million worth damages according to the Post Disaster Needs Assessment. The prolonged drought since 2016 has been seriously affected the livelihoods of agriculture communities which triggered drought relief, counting over USD 95 million. The recovery cost of these continuing damages, should have been ultimately invested in development. I would like to table the fact, it is evident that the impact of disasters further triggered by Climate Change, has negatively contributed over economic growth in our country, and I believe that it is the case in other Asian countries too. In responding to this, the government of Sri Lanka has been able to enhance the effectiveness of our DRR & early warning system, showcasing massive reduction of life losses during floods and Landslides in May 2018 with a comparison to 2016 & 2017 events. The Government of Sri Lanka has understood and prioritized disaster prevention against general response interventions, which is the foremost drive of Sendai Framework. Since the previous AMCDRR in 2016, Sri Lanka has considerable progress, in implementing the two-year action plan. We have developed country action plan, suiting to local context, and has developed local targets which are essential elements. We further have been identified the relevant implementing stakeholders in the Government set-up and dialogues are continuing for effective implementation. But it’s all about implementing and monitoring our policies through an integrated approach. I’m pleased to note that, we were able to produce a Community Resilience Framework in 2016, which facilitates Risk Sensitive Planning in our country. But, I must admit that the effects of this policy implementation have not yet reached its heights. Highlighting a notable example: the “Resilient housing project” was able to identify over 15,000 high risk houses and phase one of programme is on progress. Further flood management project, Climate Resilient Improvement project, Agriculture modernization project are some evidences of risk reduction strategies which are being implemented by the government. In my recent learnings, this is not adequate, the vision is so long and things yet to be done, not only in my country, but in the region in General, you may agree with me. Further, I’m humble to echo our previous proposal to establish a “Asian Emergency Response Task Force” to this esteemed gathering to mobilize country resources during a major catastrophe in an efficient manner. We as the Government of Sri Lanka would like to pledge our passionate backing for you in every endeavour.